2012 has brought a great Summer for riding around here. But I have not made my long distance riding plans a reality – they are still in the dreams department. And as days get shorter, the cooler breezes arriving, the birds already flying south, maybe they will only happen next year. But except for July 29th, I’ve been riding every Sunday since the weather firmed up. 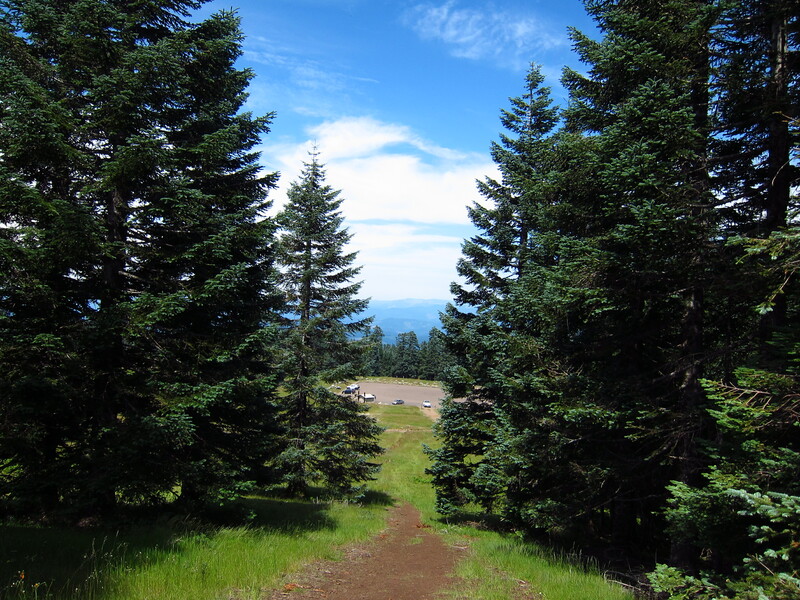 This post is about my ride back to Mary’s Peak on August 5th. 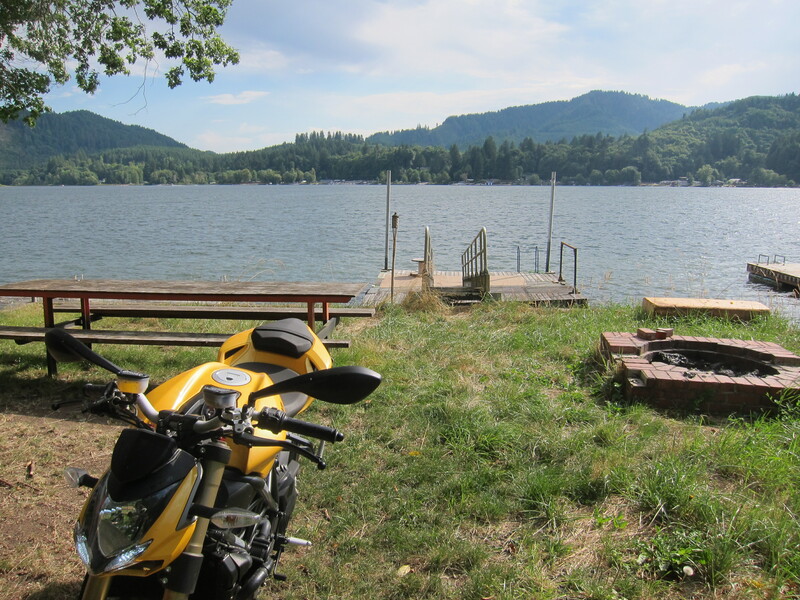 The weekend before last I had ridden the Yamaha and on the following weekend I was out of town. 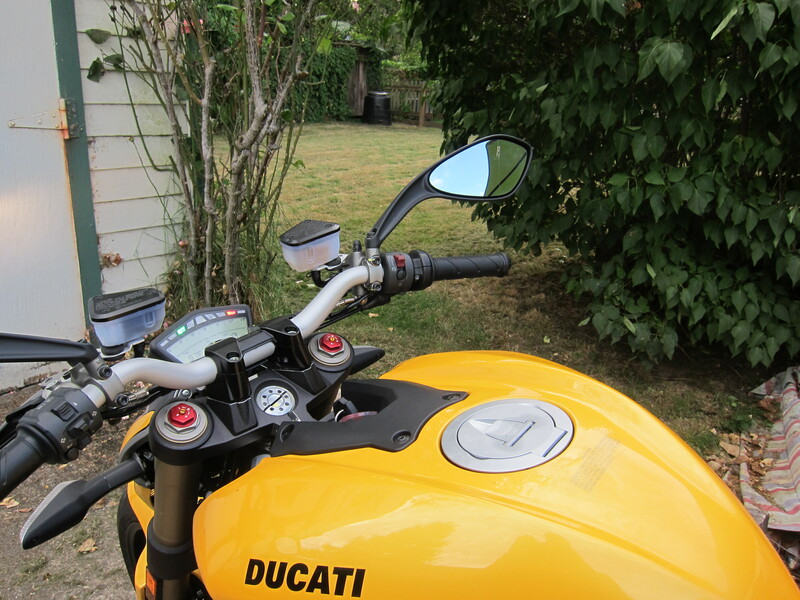 So it has been two weeks since I rode the Yellow Ducati last. I missed her and her idiosyncrasies. That tall first gear that requires slipping the clutch for smooth take offs from stopped, that aggressive stance, the hard suspension. And I missed its qualities. The ease in which it gains speed, how glued it feels to to the road, how directly she communicates about the road you are on, how that V-twin sounds and feels under you. You see, if I was talking about the Yamaha I would be talking about how efficient that machine is. 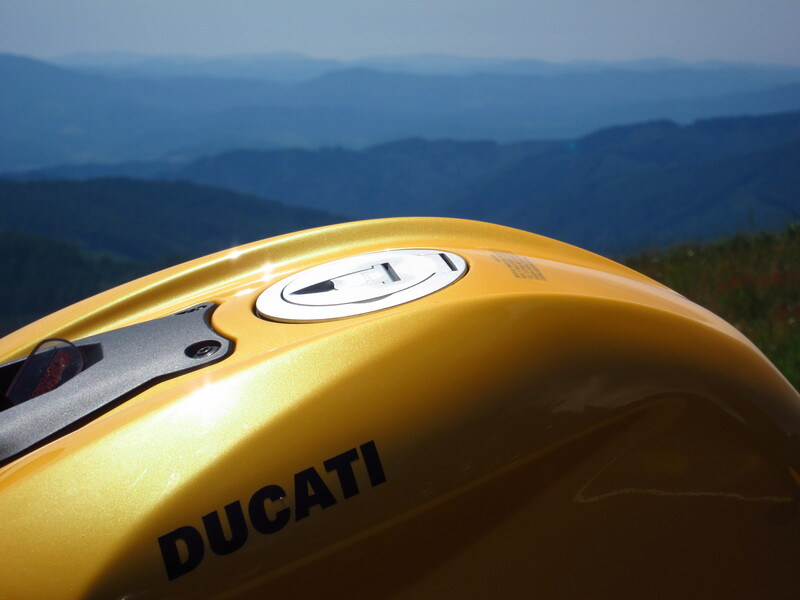 The Ducati is a different animal, it makes you discuss matters in a philosophical way. It was 77 degrees on the fake measurement unit (Fahrenheit) when I left home. By the time I had fueled and hit the country roads, it was already 82 degrees. It was going to be a warm day. 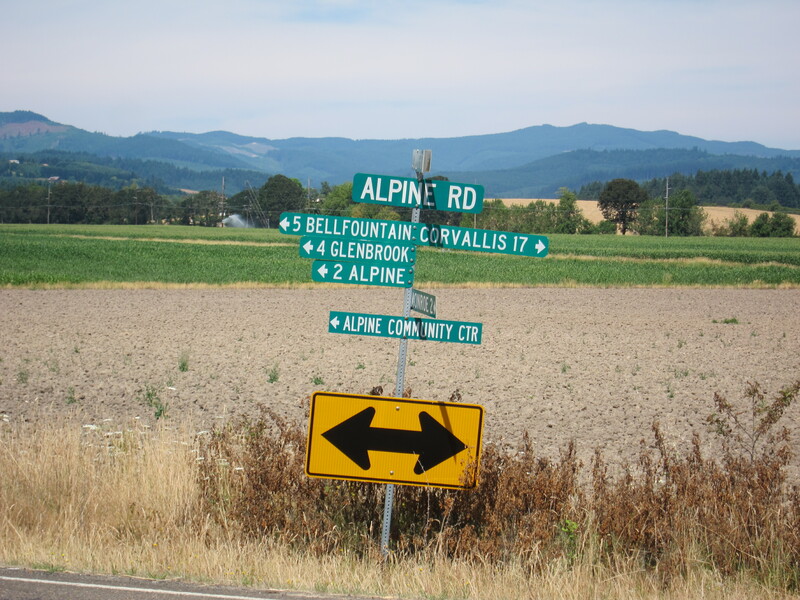 I took my usual way out of town, straight north-west via Prairie road to Territorial and from there to Alpine Rd. 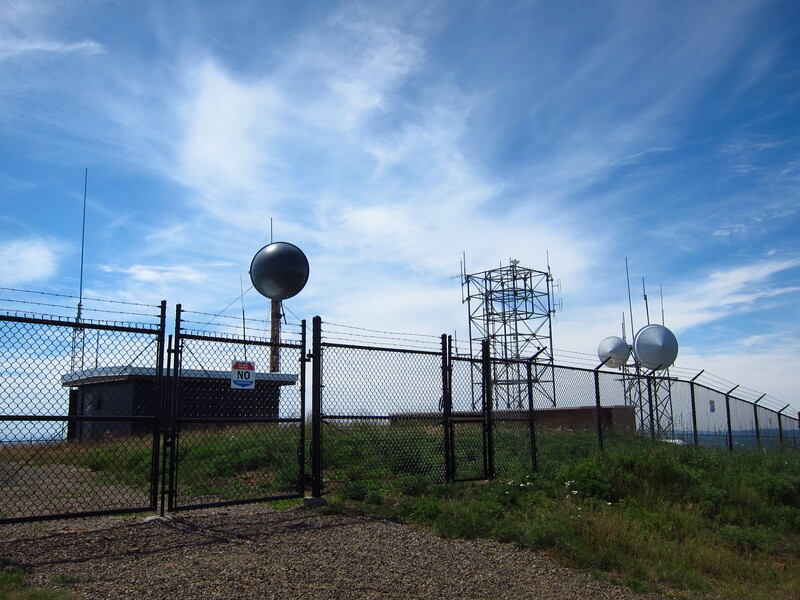 I knew the skies were not clear, and the view from St. Mary’s Peak would be compromised. But hey, if it doesn’t clear by the time I make it to the summit, what will happen is that the Peak remains on the list of places to go on a next ride. How could that be a problem? The climb was uneventful. Just that the road was patched, and now it is worse than it was the first time I rode it this year. 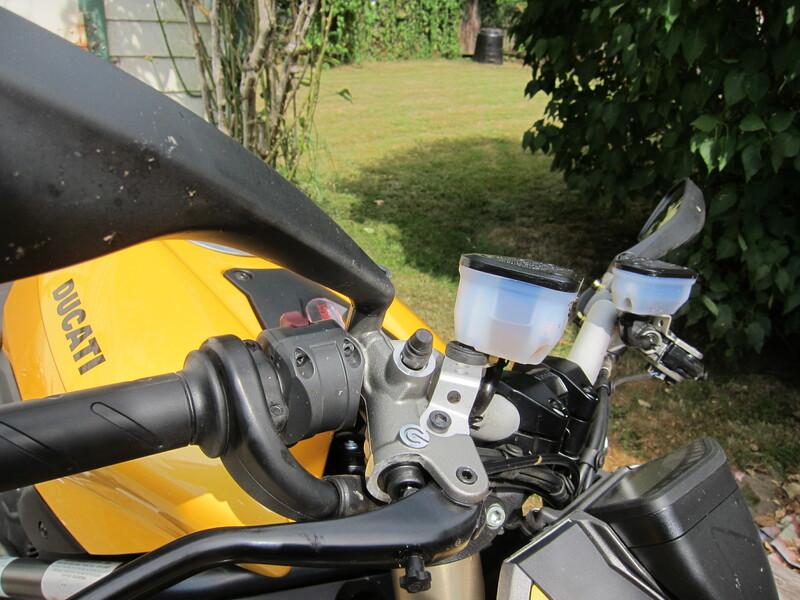 Up close you can see the problem from a motorcyclist point of view. I made it to the first view point to the East. No sign of the Cascade peaks under the curtain of the hazy skies. Not so bad… better than last time. Makes me wish for a next time, though. The situation had cleared some, but not enough. Still it was great to be there and I continued climbing. But not before taking more pictures with the Ducati as a model. A nice shade of yellow on nice shades of green and blue. All in the family of colors. and decided to hike the .5 miles to the summit. I have to say something about my riding boots here. This thing is comfortable for riding, it is waterproof, warm enough in the winter, and still works very well when walking. It was quite a hike. Half-a-mile climbing on gravel roads and trails seemed more like 2 miles on foot. Yet, my feet were always comfortable. 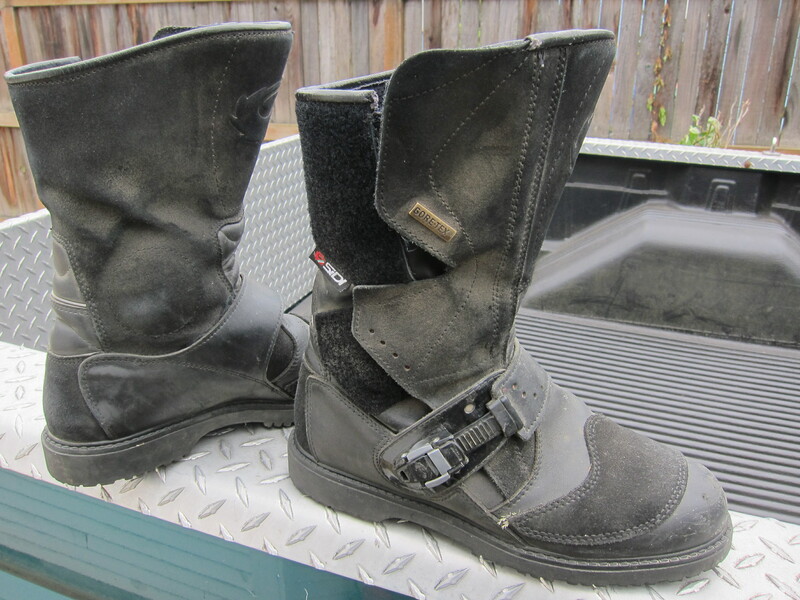 These are the Sidi Canyon boots. I started the 0.5 mile hike up the trail. 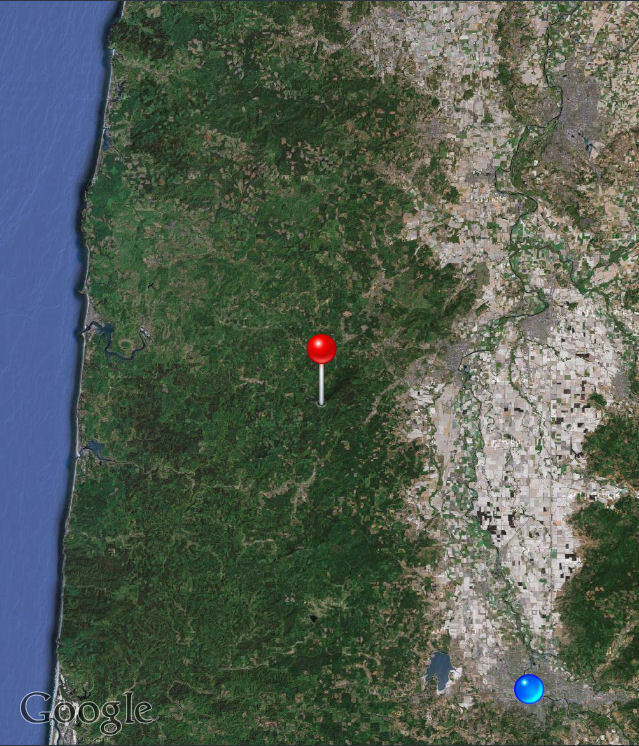 But first, this is where Mary’s Peak (the red pin) is located in Oregon in comparison to Eugene (the blue pin), north-west, it could be exactly 45 degrees. 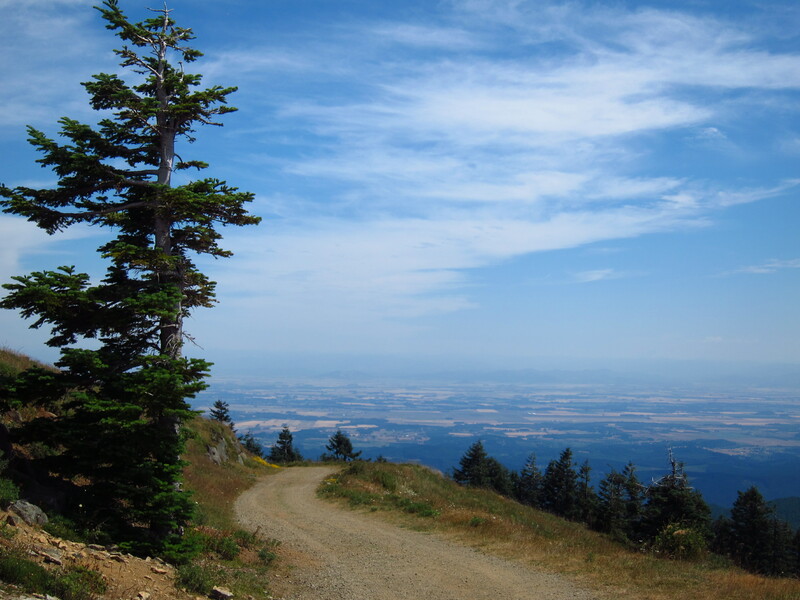 I talked to a park ranger when I was parking my hike there, and he told me that on a clear day from the summit you can see California, Washington, the Cascades and the Ocean. But that it would not be the case today. And he as right. 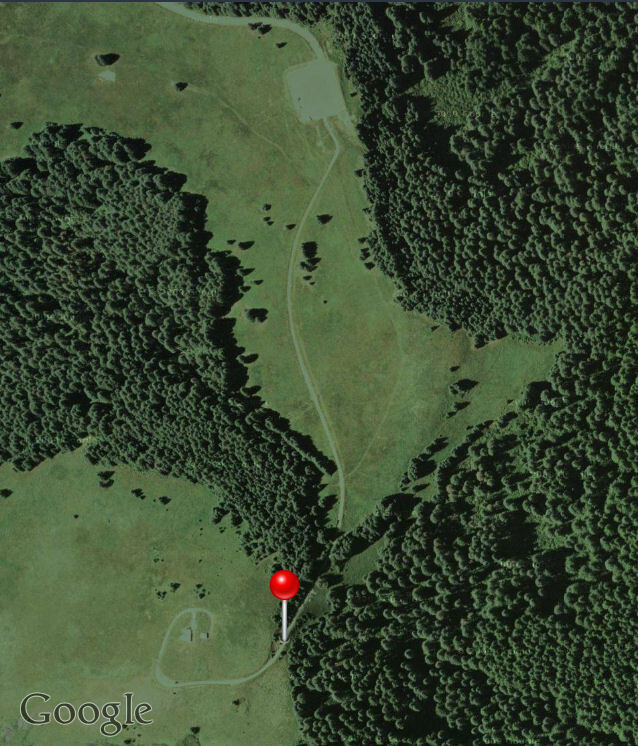 Google Earth view of Mary’s Peak in Oregon. 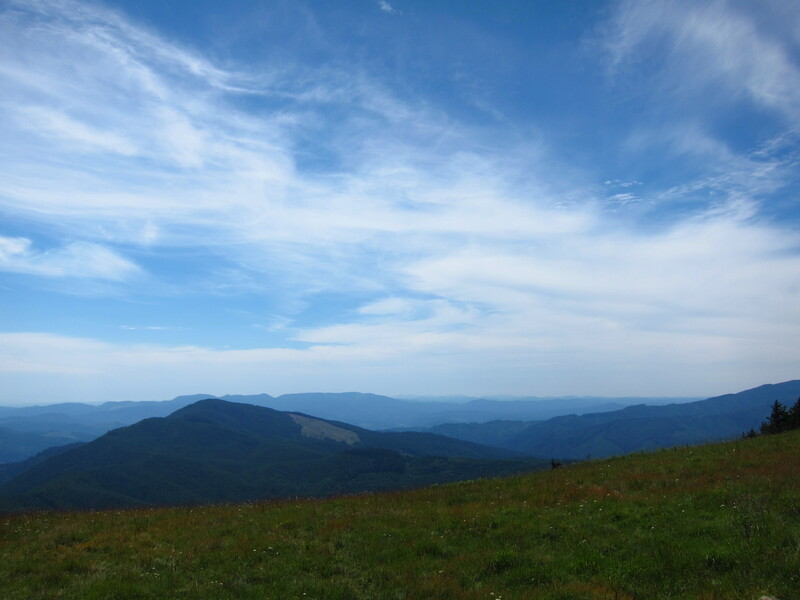 And on the photo below is the view of the parking area (on top), the peak, and the 0.5 miles trail that felt like 2 miles long on the climb with all the gear (jacket, riding pants). on a hot day. Google Earth picture of Mary’s Peak and the parking lot and the trail to the summit. 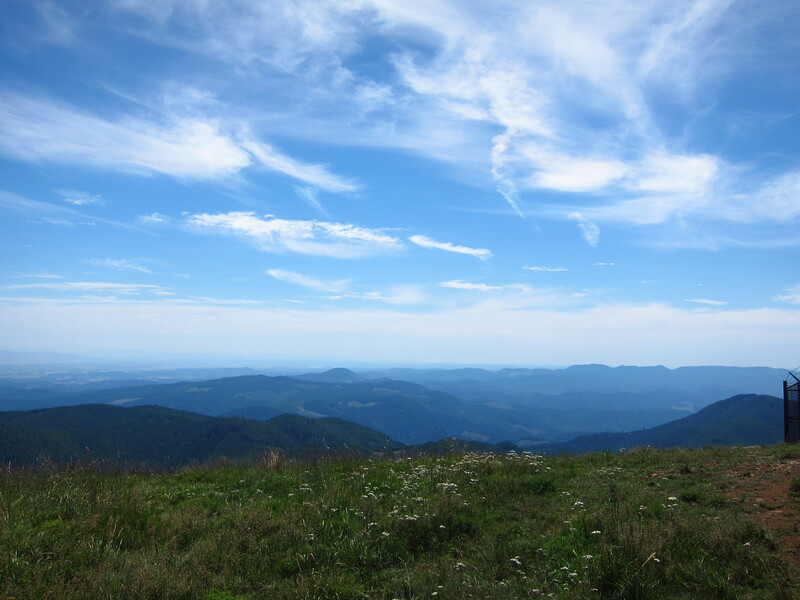 This is the view of the parking area at the beginning of the hike to the summit. The Ducati Streetfighter is somewhere down there. And this is the view to the South. I’m almost certain the tall and long range on the right, which runs east-west, is the Prairie Mountain, which is just west of Eugene. 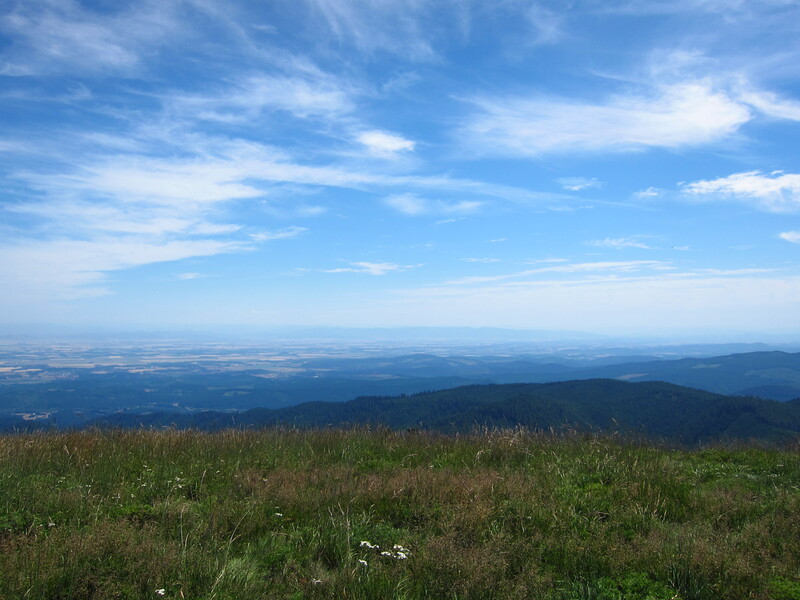 So Eugene should be somewhere straight ahead, at the beginning of the Prairie Mountain range (on its left as viewed from this photo). South view from Mary’s Peak summit. 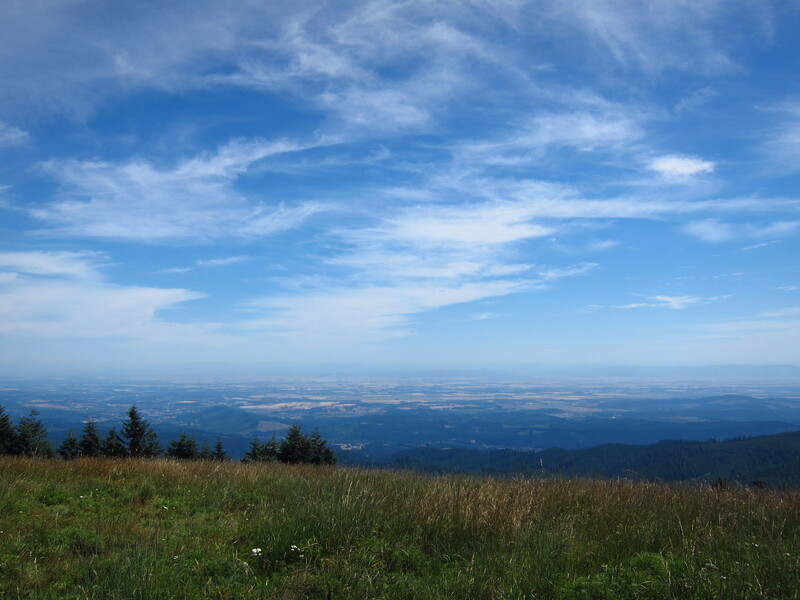 And this is the south-east view, the Willamette valley. On a clear day we should be able to see the Cascades and its snowed peaks on the other side of the valley. 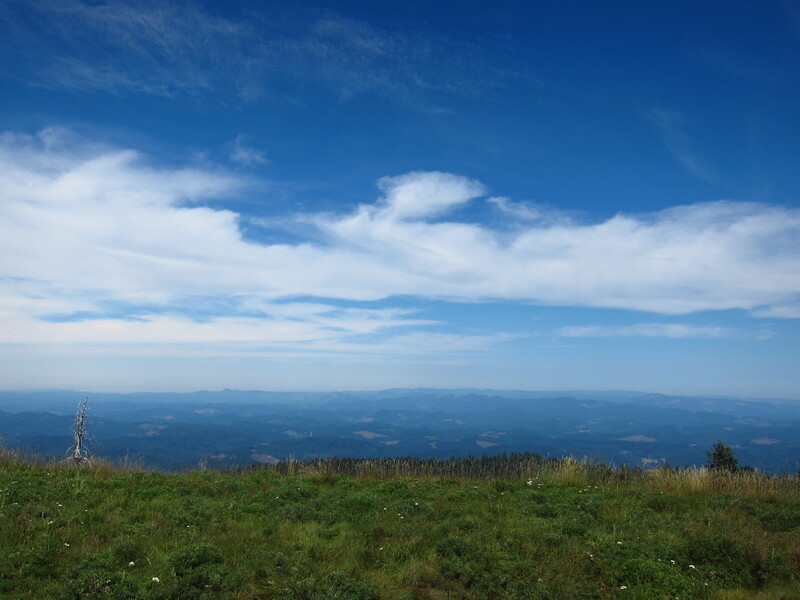 The south-east view from the summit of Mary’s peak. Here is the north-east view. 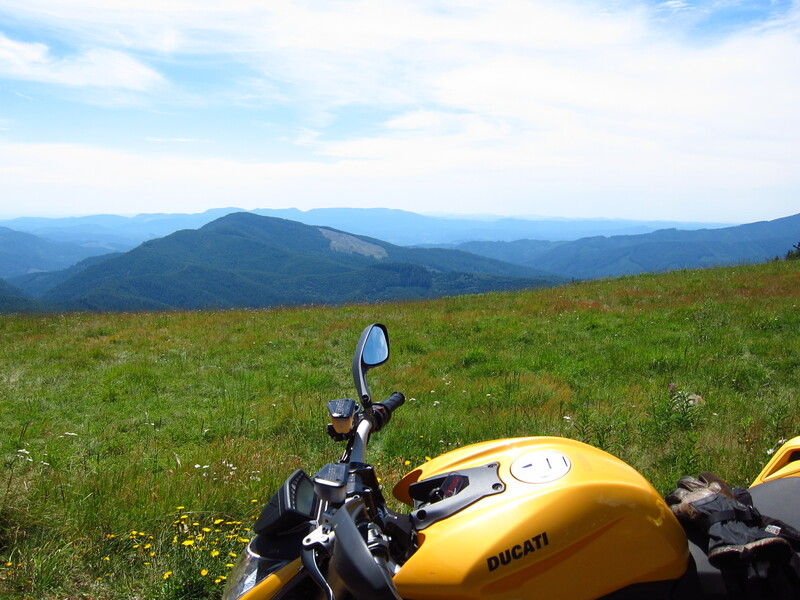 Again this is the Willamette Valley. I wonder if we can see Mt. Hood on a clear day. If so, it should be in this direction. 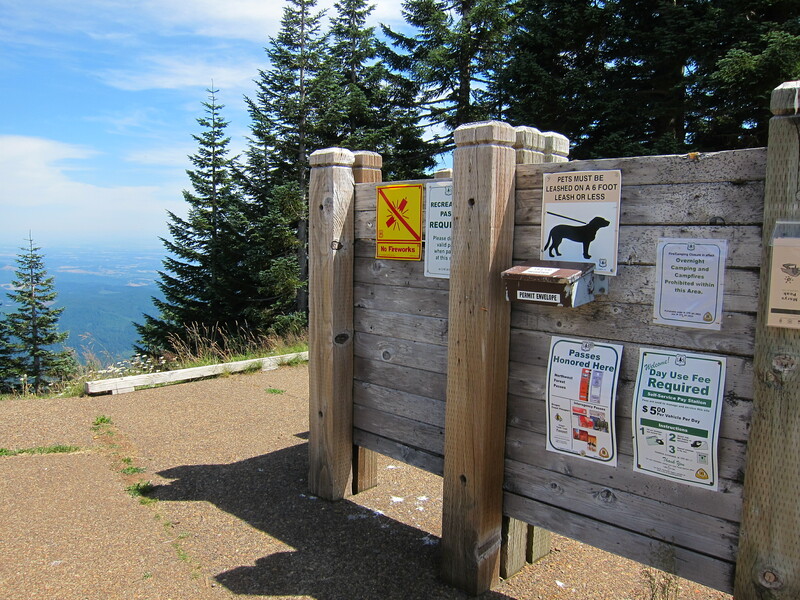 The north-east view from Mary’s Peak summit. The north view from Mary’s Peak summit. And the west view. On a clear day I was told you can see the ocean. 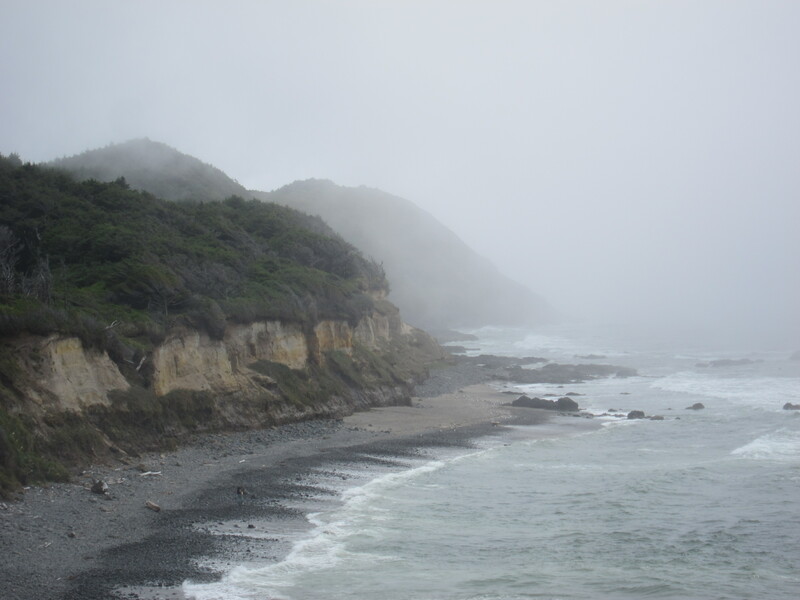 Today, we can see there is fog on the coast. I will check that out soon. 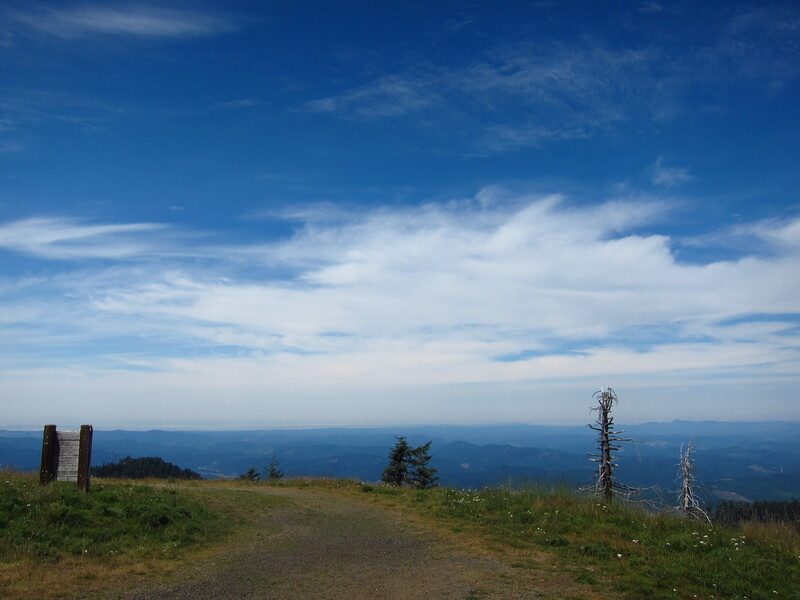 The west view from Mary’s Peak summit. I started my hike down back to the parking area. Nice views along the way. South west view on the way down from Mary’s Peak summit. When I got back to the bike, there was an envelope soliciting the day use fee for parking in this area. I only had $2 of change. So I owe $3.00 to the park system, and that is another reason to go back there. 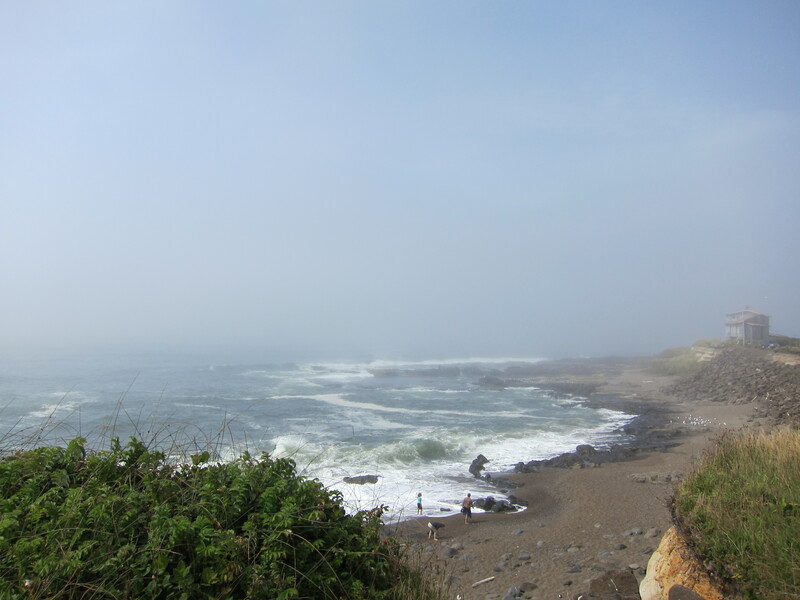 I rode down the mountain and took Hwy 34 towards Waldport and the coast fog I checked from Mary’s Peak was confirmed. 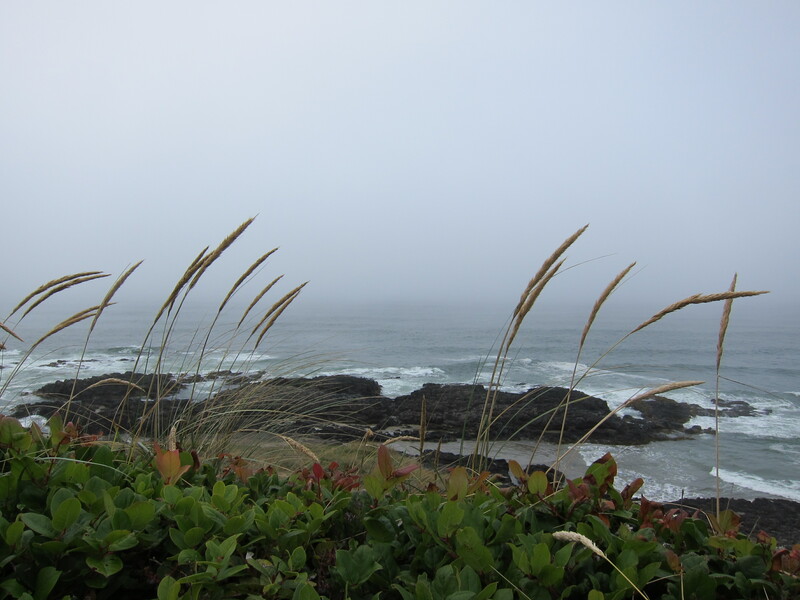 I made my way to Yachats and stopped at the Ona Restaurant for a late lunch. 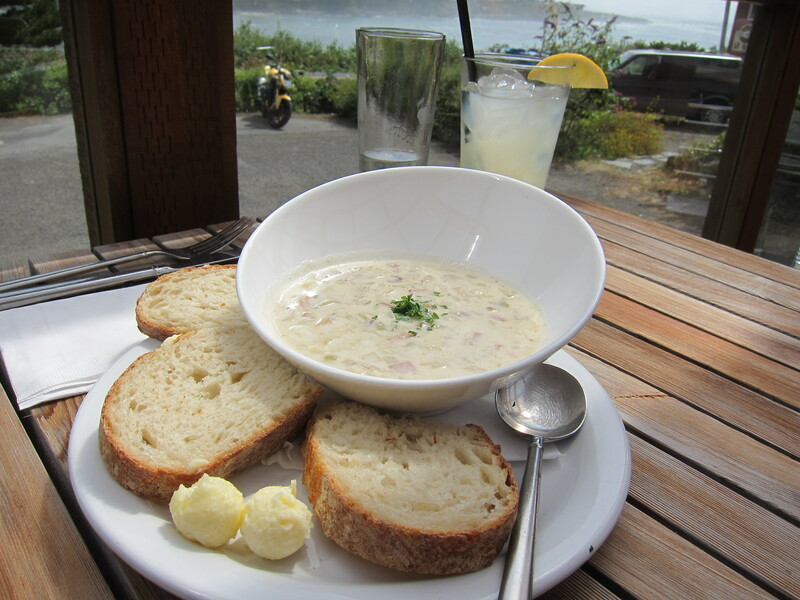 I had a bowl of their Manila Clam Chowder and a glass of lemonade. The chowder tasted great. Or I was hungry. Or both. I stopped on a couple of road lookouts to take in the view. 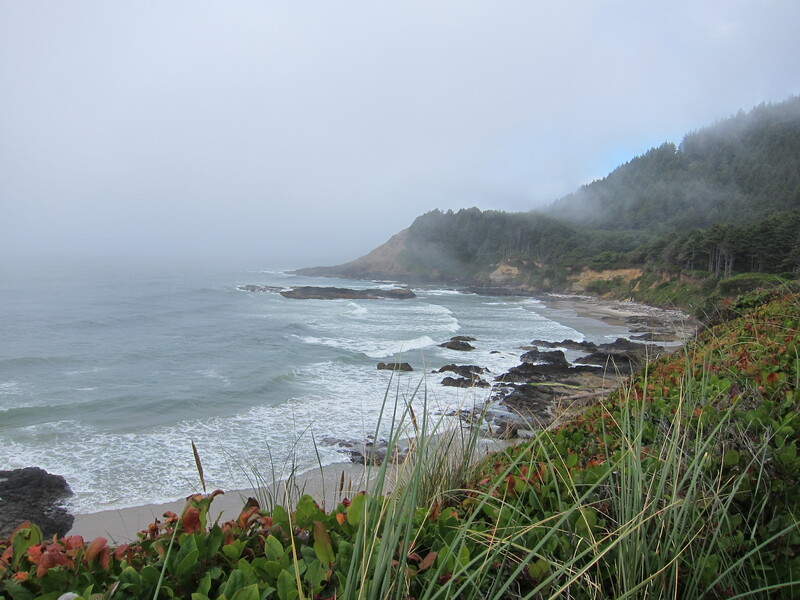 I can’t stress enough the many great viewing areas along Hwy 101 in Oregon. Especially on the Florence-Yachats area. Really, anywhere you have a nice view of the ocean. I continued south towards Florence where I made a left and took Hwy 36 back home, my usual route back home. And because two weekends ago I showed you a view of Triangle Lake from the top. This time I stopped to document Triangle Lake from ground zero. 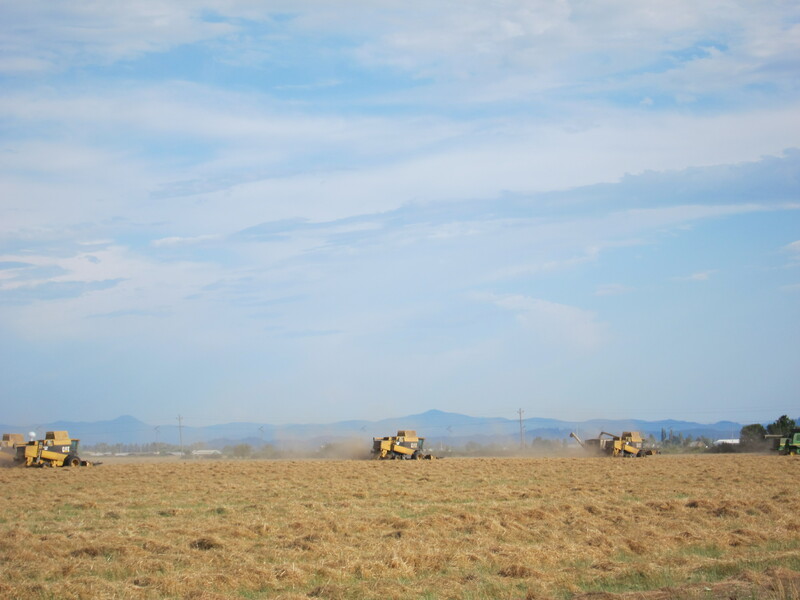 Continuing on Hwy 36, when getting close to Hwy 99 I noticed the farmers where busy working on hay. And here a photo of the side road where I parked to see the harvest. I never edit the photos I take. 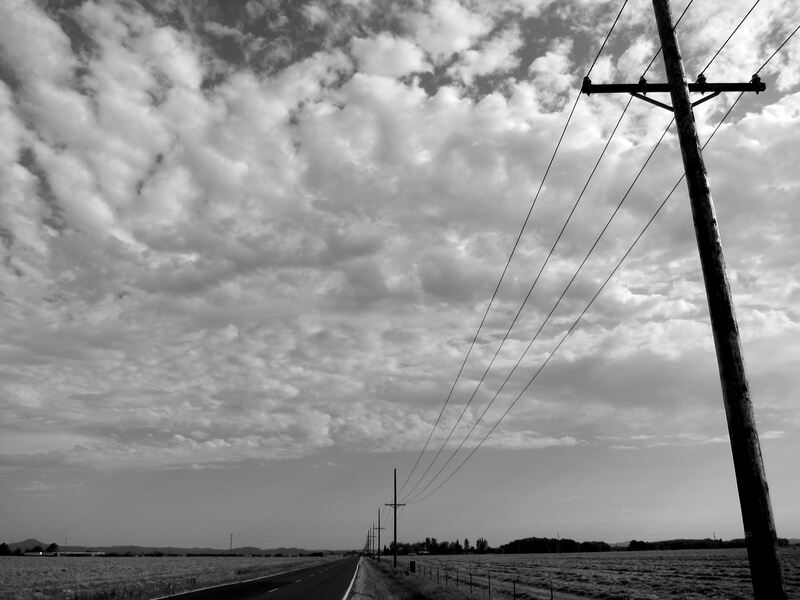 But this one I thought about making it into a black and white (and then adding contrast to it) at the time I took it. And soon I was home. Notice how the backyard grass is getting dry. The bike has now 1,945 miles on the clock. And today’s loop was 238 miles (383 km) long. Thanks for reading. 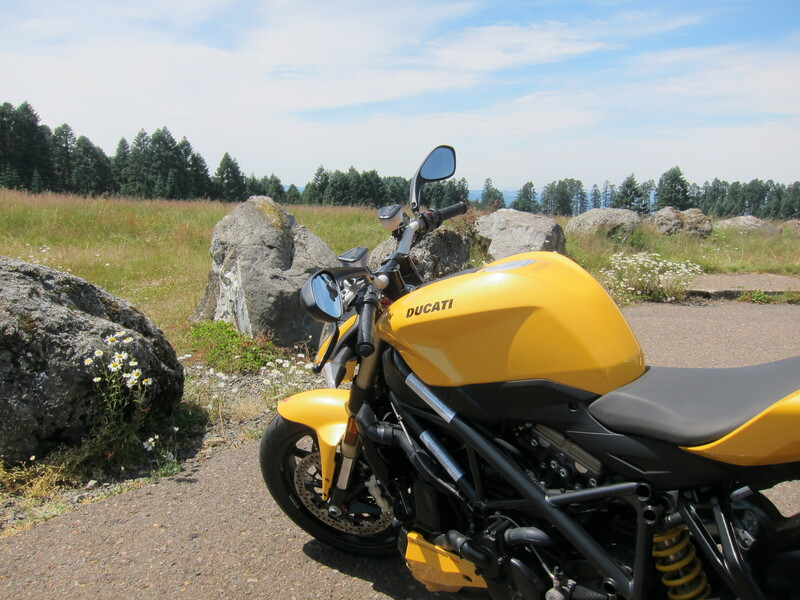 This entry was posted in Riding the Ducati and tagged Ducati, oregon, Streetfighter 848. Bookmark the permalink. 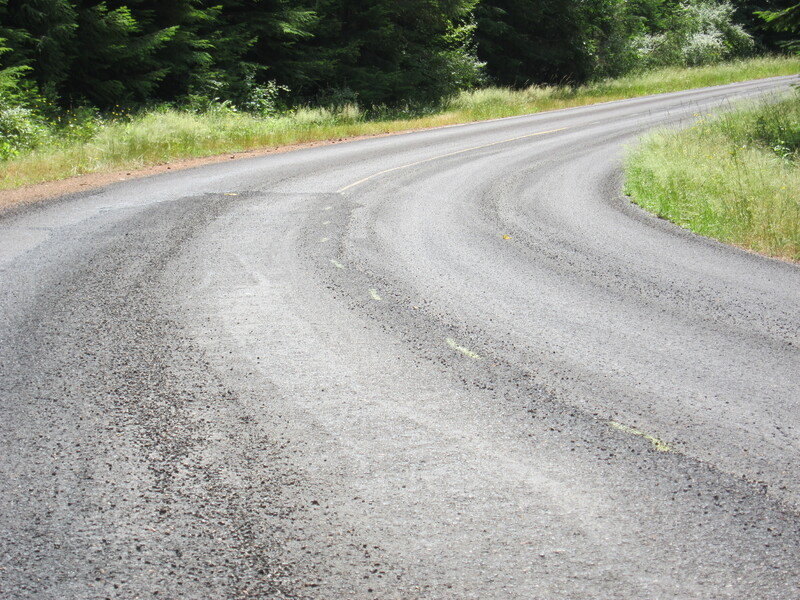 I am starting to recognize some of your roads near Corvallis. That Hay field, I was very close to it. I may even have ridden past there and I took photos before the hay was harvested. 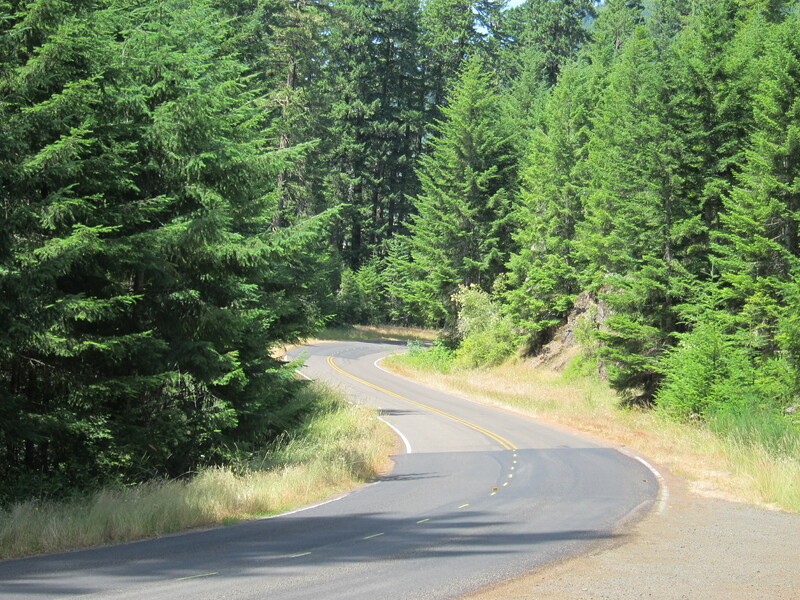 I took Hwy 34 but just before Philomath I headed south to Bellfountain near Alpine, then East to Hwy 99, then North to the Team Oregon Headquarters. I notice from my map I could have just gone east from Alsea but I don’t know the area. I notice you liked the Ona. I will be down again late September and if I get a chance perhaps I could try the Ona this time. It must be good if you tried it two times in a row. Bob, you got it. Those are the roads off of hwy 99 that I use to connect Eugene to Hwy 34. I never quite make the same route. There are plenty of these hay fields in the valley. I have another report to post (I’m still catching up) that show more hay and all of that. It is worth stopping by the Ona restaurant.